Those of you who’ve played the Alpha rules from the Kickstarter will recognise the set up. It’s largely the same. What has changed are some of the details on the Heroes, which obviously changes the balance of the piece as a whole. The two fighty Heroes (Dwarf and Barbarian) are least changed because they were already quite close to the archetypes they sprang from. A tweak here and there was all that was needed. The Elf is also little changed, in some ways being the point around which the others have revolved. Someone has to be a reference point. The Wizard is the most different, or should I say his magic is. Thanks for the update, Jake, much appreciated. Now I’m going to try and work a little Photoshop magic to see if I can work out what is going on with those cards and spells. Turning them around by 180° is enough. Though I dont really see much of a difference… Different spells. Maybe… Flamebolt as a new minor spell to deal damage. Burn only 4 dices and a change in Feet of Stone, which I can’t read :D.
A minor attack spells sounds about right, even though 2 dice are very few if you consider the needed 2 damage to hurt an undead. With burn down to 4 dice I think the Power of the Wizard is still reduced with these changes. In survivability thats ok, he should be the most fragile character, but I think with this burden, he should be the charakter with the most damage or by far with the most possibilities and still comparable damage. At the moment I think he deals the least damage and his special abilities are only one with a mostly small effect (feet of stone). These are just my thoughts without playtesting, so maybe I’m totally wrong, but at the moment i wouldn’t want to play the wizard in this scenario, because his effect in the game is to little. Maybe a minor healing spells, just 1 point of damage, even though that sounds kind of strong… maybe only to adjacent heros. That would but the wizard in danger to use it, but he has a greater effect in the game. I realy like the mechanism with major and minor spells and I hope we will see more spells! Buffs, healing, different damage spells, teleport, maybe some spells to interact with the environment, thinking of something like “light” in Warhammer Quest or magical walls, etc… Even though thats mostly for the advanced rules. 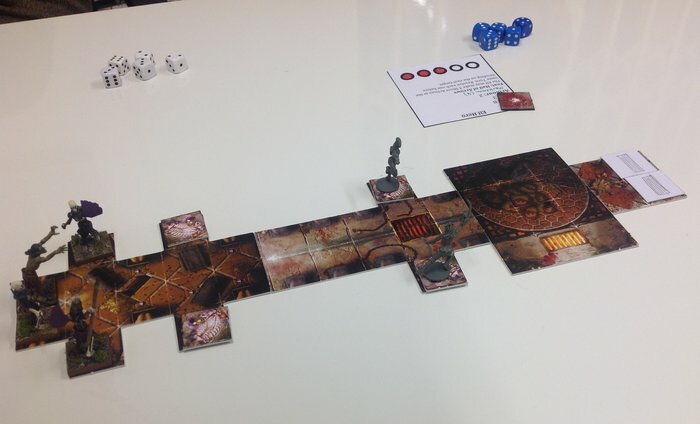 I like to hear more about the development of Dungeon Saga, to give as many feedback as I can. Maybe some of it is useful ;). Wizards will get a lot more spells as they level up. This is the Wizard at his weakest. Remember though, that part of the intent here is to have the Heroes work as a group. Leaving the Wizard physically weak and in need of some backing up and protection is part of what encourages the cooperation between them. On the other side, the Wizard can do some stuff the other Heroes can’t do at all, and so he is very much needed. In the scenario shown here, you can’t win without his magical attacks as well as his ability to break the magical wards on the door. I know he is in this mission the main character and I like the idea of the heros backing up and protect the Wizard and the flaming bolt is pretty good for this mission. Makes the role of the Wizard in this mission more attractive. Just breaking wards without anything else to do was a bit boring. The bolt is a nice way to get some additional action and for that 2 dice are ok.
Sure different players want to play different characters and differnt classes. I like to see them all in this game :). The point is normaly I’m a Wizardplayer. There is a lot of ideas and concepts of the game that are still not in public and so not knowable for me, so my comments are only based on my knowledge. More spells and other scenarios or mechanisms (magical attacks needed? ) could change my thoughts entirely ;). That in mind I got some questions about the game development. In which order do you create a game? It sounds as if you start with the very basics mechanisms coupled with some scenarios and then start to expand it. Is this correct, or do you also testing endgame content without public. I bet the creation of a game takes a whole lot of notes :). How do you mange a game of this complexity and with all this influence? Some big questions on design there. In brief, I start with the story: what is the game about? That informs me of the appropriate style and level of detail. The core mechanics (whatever they may be) are critical because everything else builds on their foundation. You only need a couple of scenarios to test (and retest and retest) them, and in fact much of any further work may be wasted if the core changes. Once the core is solid and no longer changing then you can usefully work on additional scenarios and more refined game balance. Of course, that’s ignoring what the client wants (if the game is for someone else). They may well define a specific tone or level of detail, or have a particular range of models to include, budget to work to, and so on. All of that has to be accommodated from the start. Thanks for your reply. It’s great to hear your thoughts behind the rules and design. So everyone sure is interested in these counters and their meaning… Sounds like Time for the pdf ;). To work out a solid core system first sounds about right. Did it happen that you have changed the core system later on. I can imagine that a solid core system can limit the advance rules and need some twinks to make them work. Also I can imagine that the advance rules reguires a lot more playtesting than the core game, because of it’s higher complexity. How do you deal with this issue? That is a aweful lot of accommodate. Do you only have your playtesters or do you also have co-writers that are helping to design the game? To outsource some minor design aspects. 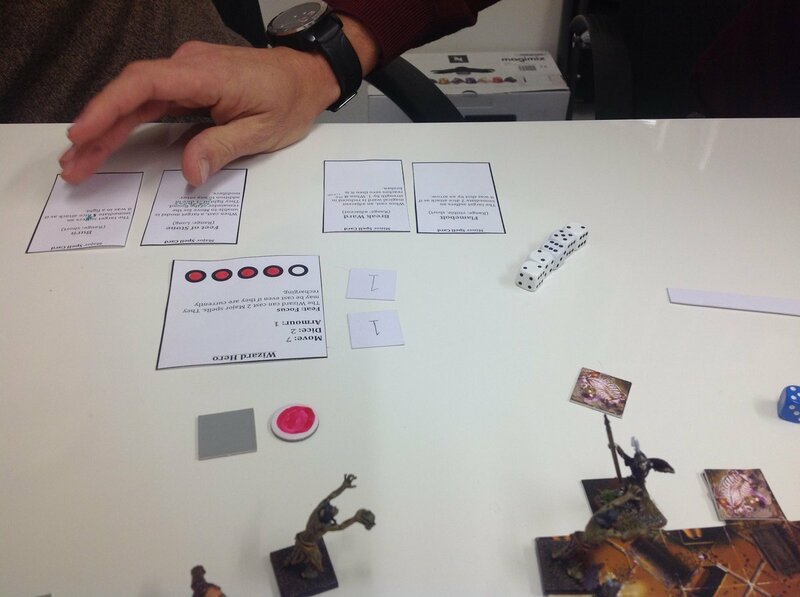 Whether core or advanced rules need more playtesting depends on what you;re playtesting is supposed to achieve. If it’s perfect balance, then the core might still need more. That’s because the advanced rules are aimed at a slightly different audience who are usually less interested in a perfect balance and a re more about variety, options, story and so on. I have seldom found co-op design to work well. Possibly that’s just me, possibly the people I’ve worked with. However, it isn’t something I’d suggest as a route to great results. Occasionally the amount of stuff that needs to be done requires giving someone else an expansion or similar, and in that case it works best if it is entirely self-contained. I’m still not comfortable with it though. Thank’s for the reply. I have to admit that I have a different opinion about balancing. The advance rules aim for longtime players and they will get real into the rules. Knowing every bit of it, every last item skill and such. While doing so, they will find the strongest combo in no time and when there is leaking a good balance the game becomes boring, cause eceryone is aiming for the same thing. A big variety doesn’t solve this problem. I higher variety without balance is easily selfmade, but balancing such variety is a lot of work and nearly impossible for a playgroup, because everyone partisan. Still i’m feeling with you about the bad feeling giving something out of hands. Especially when the only design made this way which you realy liked didn’t get published. I wish you more luck this time ;). Any progress on the idea of the images on the boards affecting the game play? At present, the base tiles aren’t going to modify game play. To do so would restrict their versatility, and I’d rather have the increased flexibility. Overlays of furniture, traps, chests and so on will be available as things for the characters to interact with, and this should cover what I think you’re asking about. Being overlays makes them more flexible too, which allows for a much greater number of options, especially when building your own dungeons. All of which isn’t to discount having tiles that include built in effects in the future. Rivers of lava might be an example. Well given the results of the kickstarter you do have 5 tiles sets to make interesting for use so the future for this game is really the now. I really hope each specific set of tiles will provide different shapes, different hallways and so on, not only different artwork. All the new tiles that have been done so far are unique shapes. New game dynamic with the 1 tokens is interesting. Different spell cool down times? mana? action points? something else exciting? who knows! Extra die able to be spent on certain actions only usable once per game, maybe there are 2’s as well on higher levels? I am looking forward to trying new rules unfortunately my other play tester has gotten board and is playing other games at the moment, Solo play makes it hard to hide tactics! Looking at the top picture has the elf had a boost to armour 3? Also have you considered dual level spells like combining flame bolt and burn, so you can use the low level version every turn (2 die as if shot require Los), but if you use the high level version (4 die as if in fight so modifiers? Also no Los needed) the card is flipped for recharge and neither version is available for a turn. No, the Elf is still armour 2 and really wants to fight with a bow at a distance. I had a good look at those spells, there are some penned hand amendments which I can’t really make out, these could change the spells workings/effectiveness dramatically. It seems that Burn has had the rule about ignoring modifiers removed, which will make it less effective in some circumstances. Flamebolt seems to require LOS and is a pretty weak spell with only 2 dice. However I guess it may be like a magic missile type spell where it’s effectiveness is proportional to the casters level…so it could end up being quite a powerful spell as the Wizard gains levels. It may also be more effective against certain types of creatures…for instance some creatures, like Mummies for example, may be more susceptible to attacks that contain the word “Flame” in their title, or something like that. Jake, can we have some Movement and/or LOS blocking spells so I can use the very cool looking Zealot Miniatures “Wall of Flame” and “Ice Wall” resin spell effects, please. Some spell rules are generic and so do not need to be written on the card. Several spells will come in families that are effectively the same spell, but better. As the spell caster levels up they get access to the better version and so will bin the earlier one. Movement/LOS blocking spells are on the list. Not sure about ice and flame walls yet. I actually really like the way you have described the spell progression here. Binning earlier versions for an upgraded version…there’s little worse than a Wizard becoming paralyzed as he deliberates with himself over which of the dozens of spells he has collected should be cast. I’ve done it myself in various games which is why I thought having spells that replace previous versions would make life a bit simpler for the wiz. Of course, he is bound to still be the hero with the most paperwork to shuffle – that’s inevitable given his spells. I also notice that the Wizard’s movement is now 7 as opposed to the previous movement of 8. Still racking my brain as to what the tokens with the number 1 on them are…too many possibilities. I removed the possible actions as it didn’t really seem to help anyone. There are not many choices and most of them are obvious.Mantic’s design guru is laying out some test cards as I write, so we’ll see what we can fit, and if there’s anything else needed. It may end up going back on. Movements were tweaked slightly to leave the Elf as the fastest. Understood on the removal of the possible actions. It doesn’t bother me at all personally, and the less clutter and distraction on a card the better, however I’m a very seasoned gamer and have a good feel for what Heroes could do follows on naturally for me. When this drops in retail and a heap of people pick the game up, its quite possible many of them won’t find it so natural and the best place to indicate to new players what their playing pieces can and can’t do is to have it sitting right in front of them on the stats card. It serves as an instruction on what combat actions their Hero can take as well as serving as a constant easily referenced reminder. It may end up going back on. I’ve just cleaned off anything that isn’t essential to the rules at present. We also discussed some other forms of reference, so it may end up being visible, just somewhere else. What is the target average number of monsters in an encounter? Including the advanced games as the heroes level up? I ask, because with Warhammer Quest, there was an issue where as a campaign progressed, you could find yourself going from needing 6 of a basic monster (orc, skaven, etc) to 24. As I said, I know its early, but is there any idea yet of how many orc ax or abyssal dwarf models we might need to plan to have to cover later level play? Short answer: no, I don’t know exactly yet. At the moment I’m mainly working on the narrative scenarios to get them close enough for testing with a wider group. As mentioned above, I think it’s crucial to get the core of the thing solid first. If we’re talking about bespoke, home made dungeons then it’s down to whoever writes them to make sure they’ve got the models, and I expect people to write the dungeons around their collections. The way random dungeons are usually written will always turn up a random selection of models and that may be more than you have to hand. I’m working on a way that will still be random, but will avoid that problem. Whatever happens though, to do a properly random dungeon with a wide variety of options you will always need more models to hand than in other circumstances. That’s unavoidable. For boxed products like the initial set, all the models you need will be in the product itself. Good information! Especially for so early! Let me focus on the random monsters in random dungeons bit, and also go back to the example of WHQ (for which I’m hoping for a fresh-blood replacement, having run weekly games for years at the time) – WHQ randomly generated monsters by rolling on a chart, then rolling some multiple of d3 or d6 to determine the numbers. And this could be from 1d6 orcs at a low level to 4d6 Orc Bosses at higher levels. Do you have an idea of how the number of Dungeon Saga monsters will be randomly generated? 1d6? 2d6? 1d100? Actually, I’m asking these questions to get at this one, so let me just ask it: Judging from the projected base box/expansion contents, it looks like 2 of each monster sculpt will be included, with a third for us KS backers. With the ‘horde’ types, multiple sculpts are given, for 4-6 monsters of that type in the retail, and 6-9 in the KS backer packs. Do you foresee Dungeon Saga remaining a (relative to WHQ) low # of individual monster type through the leveling process, or should we be prepared for facing up to 24 orc axes at a go at higher levels if the dice fall that way? I suspect that DS will generally have fewer monsters than WHQ. I don’t usually favour the approach where you stick loads of models on the board just so you can take them off by the bucketful a minute later. That just makes more things to paint. I’d rather have the monsters that go on actually have the possibility of achieving something – even if it’s remote. In DS the weakest creatures all work well in groups, and either have particular rules that emphasise that or interact with the normal rules in such a way that they don’t need extra rules to derive a benefit. Also, in DS as in DKH before it, the ability to recycle some of the creatures is part of the tactics. This is especially true of the undead. Any progress on those updates? Or even hints on those counters, my current suspicion counters which are earned when doing actions that can be spent to boost other actions later. I hope the updated Alpha Rules aren’t far off from being made available to us to download and use. I’m very much looking forward to seeing them and giving the game a run through with all the new Heroes. @danny while the full updated rules are not available and I wait with anticipation for jake to return from his adventure so I can see what new surprises he has for us I have updated hero and spell cards (and reference sheet) to match jakes spoilers he has given us on my blog clicking my name should work and most of it is also in the mantic forum, just need to update to add the spells in the forum. I also really like what you’ve done with the spell and potion cards, great stuff, I’ll also use those too. I’m wondering how great of a quality difference there will be between the soft plastic Dungeon Saga Abyssals, and the current Kings of War Kickstarter hard plastic Abyssals…obviously the hard plastic ones will be better, but I wonder by how much. It may be worth picking some of them up for Dungeon Saga if the quality difference is huge. At the very least the Abyssal Champion would be worth picking up to include in Dungeon Saga. Any more news on the possibility of us getting our hands on the updated rules to try out? I am hoping for a good update when Jake returns though I think there are people in many of his games systems waiting with baited breath, so hopefully he doesn’t go into full hiding when he sees all the queries.